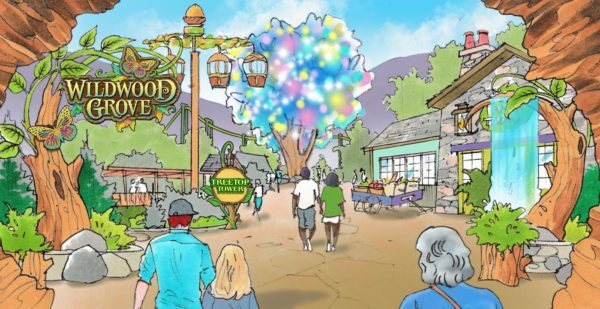 Dollywood today announced plans for its largest expansion in the park’s history: Wildwood Grove, an entire new area of the park with 11 new rides and attractions. 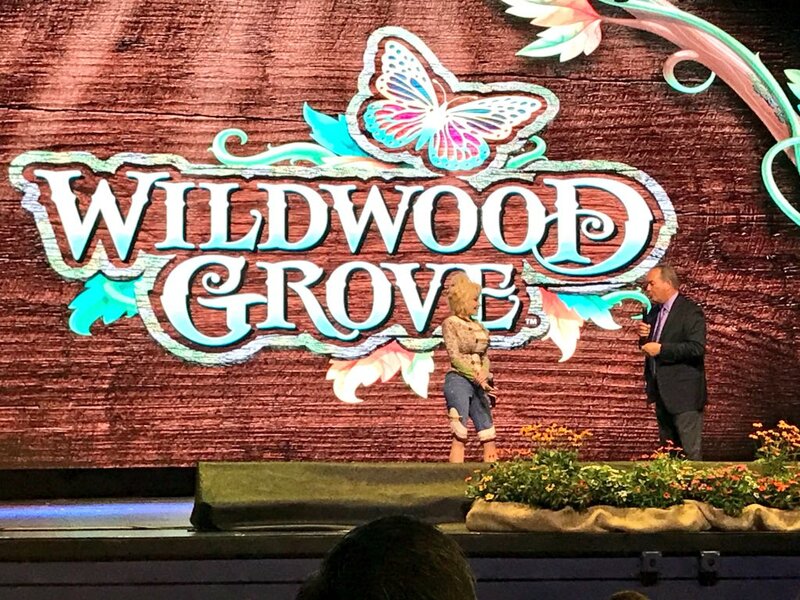 At a price of $37 million, Wildwood Grove represents the largest capital investment in the park’s history since opening as Dollywood in 1986. Guests will enter Wildwood Grove through the hollow trunk of a fallen tree. 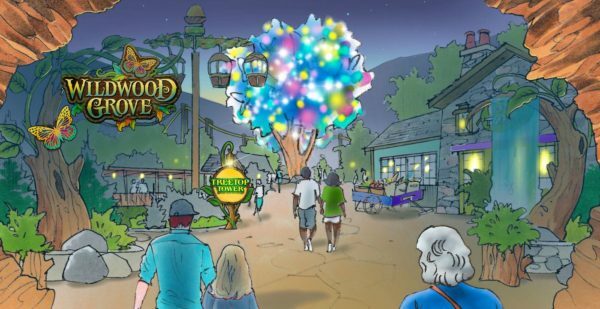 A 55-ft tall “Wildwood” tree serves as the centerpiece of the area and offers a stage-like formation that hosts performances throughout the day, with a leafy canopy above that will be decorated with butterflies that move in the wind. At dusk lanterns and lights will brighten the area in a way intended to be reminiscent of fireflies. A unique nighttime show will happen each evening under the Wildwood tree featuring the butterflies glowing in the dark with a range of colors. 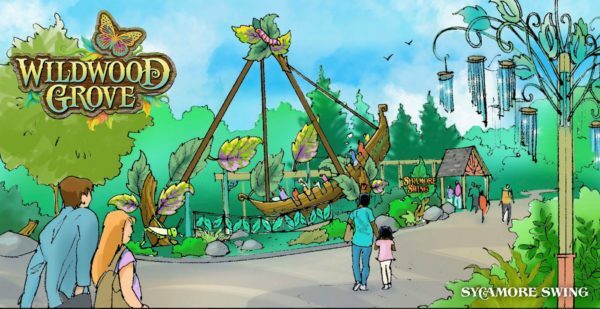 The Dragonflier: This thrilling suspended roller coaster lets guests soar with a dragonfly as it dips and darts along the gushing geysers and lush landscape of Wildwood Grove. Dragonflier is believed to be a Vekoma suspended model similar to Orkanen at Fårup Sommerland in Denmark. Black Bear Trail: Riders hop on the back of these friendly bears for a spirited trek through their natural habitat. Families will enjoy meandering through the woods of this unique Smoky Mountain experience. Sycamore Swing: Guests aboard this thrilling “leaf boat” swing back and forth just like a leaf falling from a giant sycamore tree. 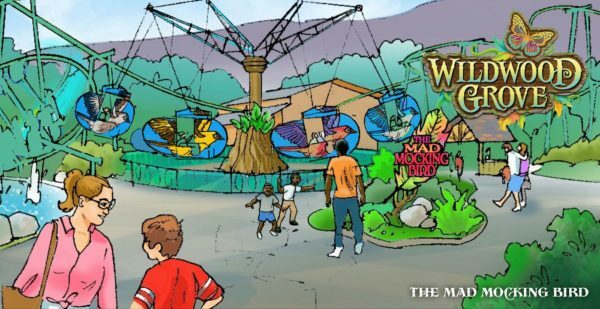 Treetop Tower: This family tower gives guests a sky-high view of Wildwood Grove as they soar nearly 40 feet in the air. Riders, seated inside giant acorns, spin around the top of a tall oak tree before gently drifting back to the grove floor. The Mad Mockingbird: Tennessee’s state bird—the mockingbird—gives visitors a lift as it flies in a high speed circle around a tall tree. Riders control their ride experience by moving a sail as the birds rush above the ground. Frogs and Fireflies: These friendly frogs hop up and down as they chase each other around the lily pad trying to catch the flickering fireflies fluttering from the tall reeds and grasses. Adventurous guests can hop aboard for this riveting race. Along with the rides, Wildwood Grove will also feature Hidden Hollow, a 4,000-square-foot indoor play space with climbing structures, slides, games and more. 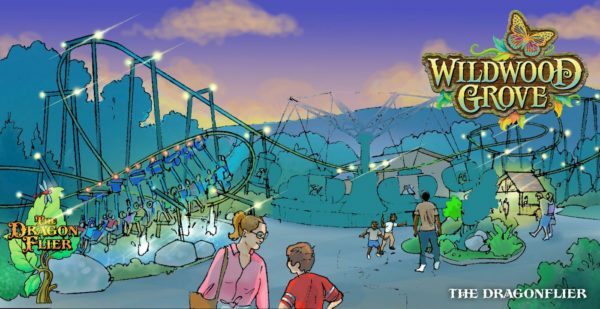 In addition to the rides, Wildwood Grove will also include Till & Harvest, a new restaurant offering Southwest-style foods including burritos, salads and more — all with a Southern twist. Along with traditional entrees and a topping bar with assorted salsas, guests can add items like pulled pork and fresh coleslaw to their selections. 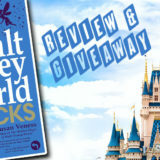 There will also be a walk-up window for sweet treats like churros and ice cream. To clear the large swath of land to make room for Wildwood Grove, the park had to remove a significant number of trees. 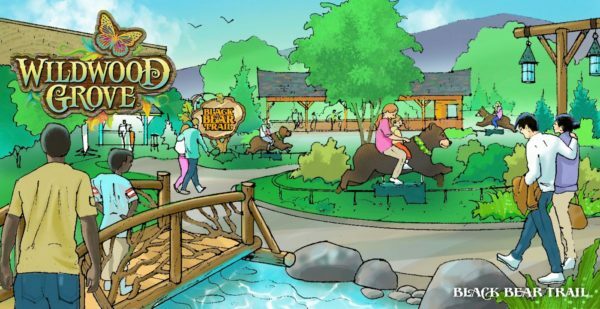 But along with the rides and attractions, nearly $1 million has been set aside for landscaping the area. More than 400 trees and 1,000 shrubs will be planted, helping transform the land into a lush and relaxing spot hidden within the foothills of the Smokies. 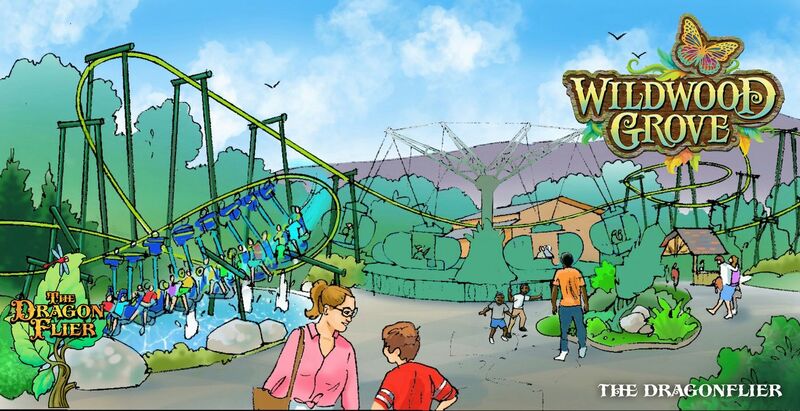 Wildwood Grove is another piece of the park’s 10-year, $300 million investment that began in 2013. Of course, the legendary Dolly Parton was at the announcement to share more details and sing a few songs. 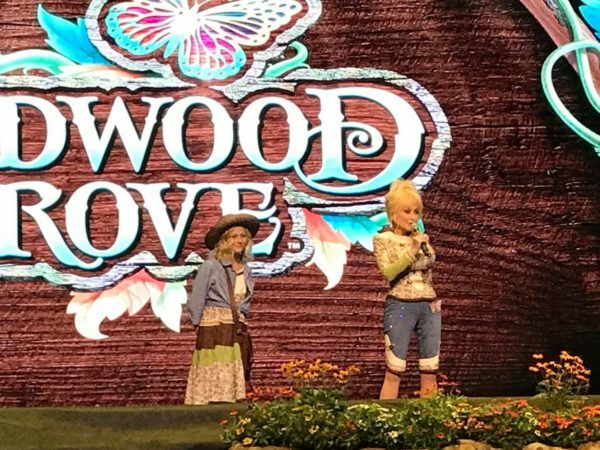 “I’ve told you before about how I’d let my imagination roam free when I’d be out exploring in the hills around our home in the Smoky Mountains,” Parton said..
We have continued to expand and develop Dollywood over the last several years but Wildwood Grove is the first expansion of the park’s footprint since we added Wilderness Pass in 2008. It is rare in our industry that a park adds a new land in its entirety. 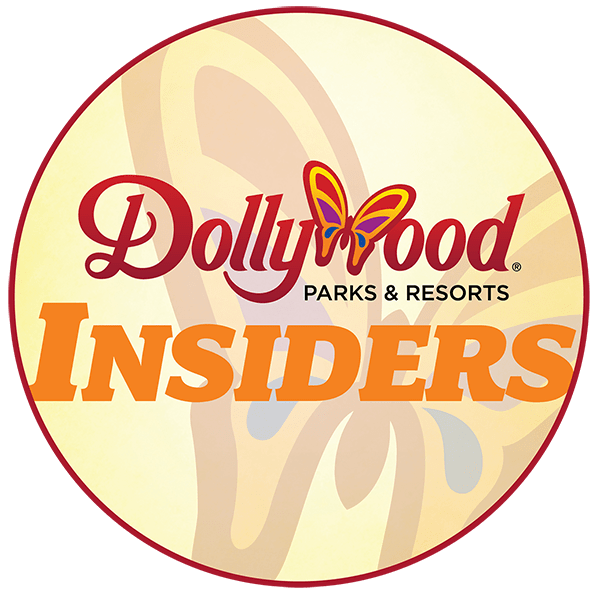 Attendance has continued to increase—we’ve set attendance records each of the last six years and we’re having a strong season this year—so this new area helps satisfy consumer needs as guests have more room to spread out, imagine and explore another chapter in the epic Dollywood story. 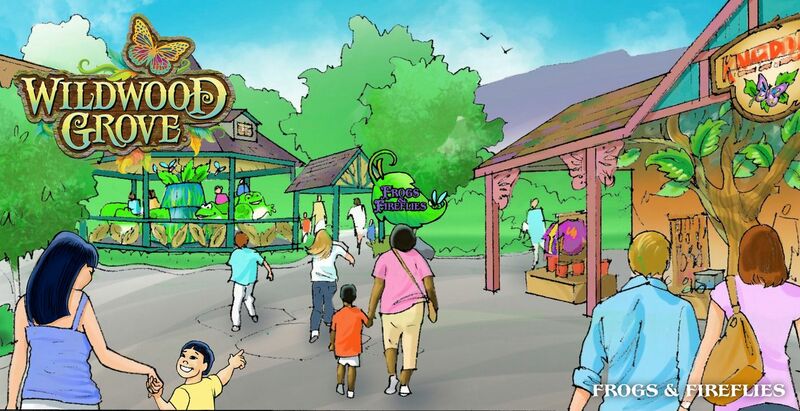 The new area is expected to open in the spring of 2019. See photos from the construction site here, and follow us on Facebook and Twitter to see all our real-time coverage from the announcement! What are your thoughts about Wildwood Grove? Share your thoughts about Dollywood’s 2019 plans in the comment section below. Holy crap that is maybe the most thrilling kid/family coaster I have ever seen. Beautiful coaster. Beautiful land they are creating. Can’t wait to see the finished product. 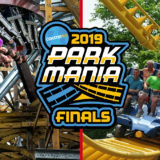 Hopefully, they can run two trains on the coaster.